This coming Sunday begins, of course, that Holy Week that leads us to Easter and the center of the Christian faith. 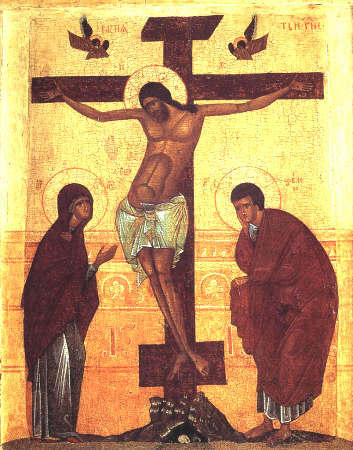 In a sermon, the theologian James Alison once said of this week, “If Lent is like a long drawn out visit to the dentist, Holy Week is open heart surgery” (given on April 10, 2006, at All Saints Episcopal Church, Atlanta, GA). That is, Holy Week is filled with intensity – and it should be, for it swirls around toward a momentous event: the murder of Jesus. We don’t tend to use this language. We talk about passion, crucifixion, sacrifice – words that have become a part of our sacred vocabulary over the many centuries separating us from the events that Holy Week remembers. Sacred language is important, and it can bring us into relationship with God, with ourselves, with one another in important ways. But sacred language can also insulate us, put some distance between us and that which the sacred language seeks to describe. To speak of the death of Jesus in terms of passion, crucifixion, and sacrifice is certainly powerful. But in some important ways, it somewhat disguises what is really going on: a murder has been organized, arranged, and carried out. A man who did nothing to deserve death is made to die because the people around him are terrified and angry. When we look at this murder in the rearview mirror, we see it as holy and sacrificial. When we look at it head on, we see it as the murder that it was. To speak of the murder of Jesus using the sacred vocabulary to which we have become accustomed, we often drift into strange theological territory. The sacrifice of Jesus becomes a singular event, unique and unrepeatable, somehow required by God in order to reconcile humanity with our creator. This, in turn, leads us to strange notions about God and about the relationship between God and human beings. But to speak of the murder of Jesus as exactly that, a murder, forces us to ask questions not about the nature of God but about the nature of our own humanity. To see the murder of Jesus as what it was places responsibility for the crime squarely on the shoulders of those who carried it out. * And it also helps us to see that the murder of an innocent man at the hands of frenzied crowds and terrified authority figures is not, sadly, a singular event, but one which has been repeated in human history over and over again – and is repeated in our own day, at the hands of people living today. And while most of us are not murderers, contemplating the murder of Jesus and the behavior of the crowds should lead us to ask ourselves how much we are like those crowds, and the degree to which we become complicit, by action or inaction, by speaking or by our silence, in the violence of our own time. There is a reason why Good Friday is not the central, most important day in the Christian tradition: it is because the murder of Jesus is an example of the many times human beings have put innocent people to death in the belief that they are serving some higher purpose. It is a powerful icon of the injustices that have claimed the lives of countless victims over human history and continue to do so today. It is not, in that sense, unique. The uniqueness of Good Friday lies not in the murder of Jesus, but in the truth that we proclaim about who Jesus was: Emmanuel, “God with us.” In Jesus, we believe that God entered into this messy human process of victimization, becoming a victim of injustice in Christ. And that leads us to the singular event that truly does lie at the center of our tradition: the first day after Holy Week: Easter, the Resurrection of Christ. In the Resurrection, the victim Jesus returns not breathing vengeance and malice, but breathing forgiveness and life. In doing so, God declares in the Risen Christ that the divine power of love is able to transcend the machinations of human injustice. The victim becomes the victor, not in a militaristic sense, but because as victor, he is able to invite us into a new dynamic of human existence, a new life that transcends the dysfunctional human dynamic that led to the murder of Jesus and leads to every murder. James Alison is quite right: Holy Week is like open heart surgery. When we see it for what it is, our hearts are opened in a new way, capable of welcoming the new life that Easter celebrates, enabling us to live in a profoundly new dynamic centered in forgiveness, compassion, and justice. *I want to be clear that when I speak of the responsibility of the murder of Jesus being squarely placed on the shoulders of those who carried it out, I am NOT speaking of the Jewish people. There is a long and terrible history in Christianity of casting the Jewish people as the murderers of Jesus, and this should not and cannot be perpetuated. The truth is that the Romans carried out the murder of Jesus, and they did so as the climax to a complicated series of events in which many different kinds of people were involved. I sometimes feel badly for my son. His 8 year old little boy self has not fully developed a breadth of sound levels yet, and so we tend to have one volume in our house when it comes to him: loud. I can’t imagine the number of times his mother, his sister, and I have collectively told him, “We’re right here. You don’t have to yell.” He’s getting better. Slowly. I am confident that when he is my age, he won’t just speak in loud. He’ll have other options, and he’ll know how to use them. Of course, I could be wrong. Because it seems to me that these days, grown ups who should know better also tend to have one volume: loud. And they employ it in one mode of speaking: rant. Yes, I’m exaggerating. But at the same time, when it comes to our public discourse, whether we’re talking politicians, media types, or just ordinary folks, it seems like we are yelling at each other a lot. In the “old days”, people used to converse, debate, take time to understand another’s point of view, then try to persuasively argue against it (or, at least, I would like to think so). Now, we seem to do what some people do when they find themselves amidst a group of people whose language they don’t share: we just talk louder. As if somehow, yelling at each other would convince anyone of anything. In fact, yelling just makes other people yell. It makes everybody angry and ill-tempered. I am tired of being yelled at, and I am tired of living in a culture of rant. I am reminded of the biblical story of Elijah (1 Kings 19:1-15a), who felt very badly treated by the ancient people of Israel, and not much appreciated. He retreated to a cave, where the Spirit of God found him out. When God asked why Elijah was there, Elijah basically went on a rant against the people whom he felt didn’t appreciate either him or God properly. When Elijah had finished his rant, God invited him into the divine presence. Initially, there was a lot of noise: earthquake, fire, wind. But, we are told, God was not in any of these things. Then, after the noise, there was the “sound of sheer silence”. And in that silence, was God. For us today, perhaps this story is a cautionary one. God is not in the ranting. God is not in the noise that we throw at each other. God is to be found in the sheer silence, as the still small voice that reaches out to us from within that silence. God is not found in the talking, but in the listening. And perhaps that’s where truth, understanding, compassion, and most of all, wisdom are also found. Enough ranting. Please. Let’s just all be quiet for a while, and listen. One of the things that stands out as one reads the stories of Jesus in the gospels is his eating habits. He eats a lot. He is often sharing meals with others. On the one hand, this is not particularly noteworthy. After all, everyone has to eat. We can be quite sure that Jesus ate many more meals than the ones that are written about. So, why did the authors of the gospels want to tell stories about Jesus eating? The reason, of course, has nothing to do with what Jesus ate and everything to do with whom Jesus ate. He shared tables with everyone. Yes, indeed, he was invited into the homes of wealthy and powerful people – and in those settings, Jesus was not a well-mannered guest: he talked about uncomfortable things that probably fascinated and appalled his hosts all at the same time. More often, Jesus is sharing a table (actual or metaphorical) with ordinary people, folks who have come out to hear his teaching or to seek his healing. And, not infrequently, stories are told of Jesus eating with people whom no one would have invited to anybody’s table: prostitutes, tax collectors, lepers, and various other categories of “undesirable” or “unclean” people. The point is that Jesus did not uphold the customs of his time with respect to table fellowship. Instead, he would eat with anyone who wanted to eat with him. It is most certainly not an accident that alongside these stories of Jesus eating with everyone there are a number of parables that use the metaphor of a feast to talk about the kingdom or reign of God. Quite often, when Jesus tries to tell people what the world would be like if God’s dream for humanity were truly realized, he compares it to a meal. And often, the parable of the kingdom of God as feast ends up with unexpected people at the table. When we put these things together, it seems rather clear to me that Jesus is describing a vision of a human community rooted in God: a community in which everyone is welcome at the table and in which everyone receives what she or he needs to be nourished. Heaven is not some city in the sky with streets made of gold: heaven is a state of unconditional welcome where each and all are fed. In liturgical churches, like The Episcopal Church, the sacred meal became the center and most profound part of Christian worship. This was the case in the Christian community, actually, long before there was an Episcopal Church. Initially, what we now know as Communion was part of a full meal. It seems that it didn’t take long before the full meal was dropped and reduced to the sharing of blessed bread and wine. In either form, however, this sacred meal was at the heart of the worshiping Christian community until the 16th century, when the Protestant Reformation for the first time produced Christian worship that did not include Communion on a weekly basis. In celebrating the sacred meal of Holy Communion, however, the focus of Christians got shifted. The meal became more about what was served than about who was present. People got caught up in what was happening when the bread and wine were blessed, and how it was that the Christ was made present in the sacrament. We lost the focus on the radical openness of the table, the significance of a group of people gathered for a sacred meal as an icon of the kingdom of God. In fact, most if not all of the churches placed limits on who could actually receive the sacred meal, subverting the radically open invitation that characterized all of Jesus’ dinner parties. As a priest, I have to say that over the years I have found that the significance for me of the sacred meal has shifted. When I began my ordained ministry, the focus was on what I got to do at the altar as the one authorized to preside over the meal. And while I still find that to be a profound privilege, the real “magic” of Communion for me now lies not in what happens at the altar but in what happens when I place the blessed bread into someone’s hand and look them in the eyes. 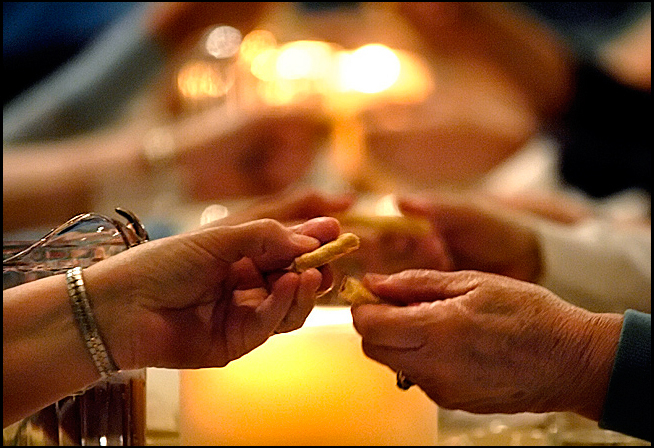 I have realized that this is truly the act of Communion: people gathered together in a sacred moment of sharing. Christ hosts us at the holy table so that we may host one another. Communion is not only about what we receive from the altar, but is equally about what we receive from one another. It is not only about being with Christ, but about us being together in Christ. And as we gather as Christian community for that sacred meal each week, we should be as radically open in our invitation as Jesus was. For the kingdom of God is not about verifying one’s credentials or conducting a background check to determine if someone is worthy of the feast. It is about everyone having a place at the table and everyone receiving what each needs. The only prerequisite to sharing the sacred meal is the desire to eat with Jesus and his friends. That desire is not the end of the Christian faith journey, something to be done after one has been fully formed. Rather, that desire is the beginning of the journey with Christ. Just as it was in the time of Jesus. After all, people were not transformed prior to sharing a meal with Jesus. Rather, the meal is what led people into transformation. May our sacred meals be equally transformative.